Want to find out about new Chicago hotspots, where to find the best cocktail, or learn about pop-up events? 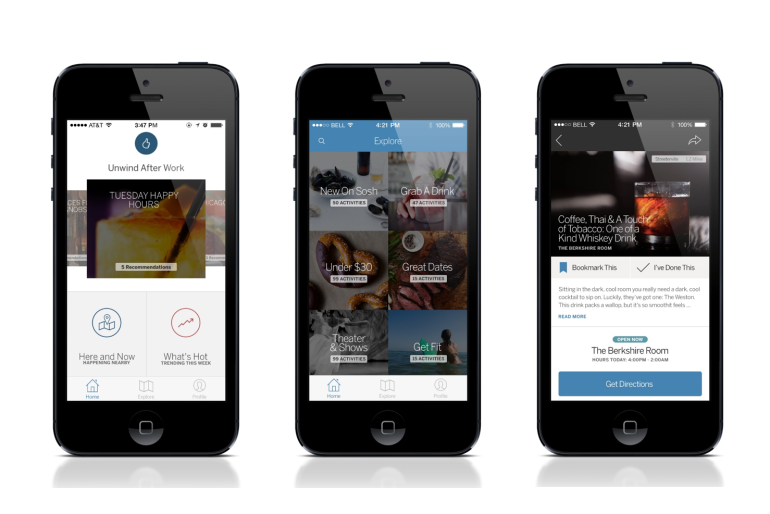 Be the first in Chicago to use new app Sosh (hint: it launches today! ), your pocket guidebook to the fun happenings around the city. Fueled by the principle that “life is too short to be bored,” Sosh gives you up to the moment recommendations tailored to your preferred neighborhoods and type of activities. If you see an event or business that piques your interest, you have the ability to bookmark it for later and share with your friends via social media. With success in San Francisco, New York City, Seattle and several other cities, the movement has come to our amazing city to help us uncover the “what’s what” about town. I had the incredible opportunity to interview Katrina Kurnit, Sosh’s Head of Marketing. Katrina’s passion for Sosh shines through as she describes her experience marketing and engaging with new and existing Sosh users. Inspiration driving the app is the age-old “What should we do tonight” problem. City dwellers often go to the same bars, the same restaurants, and stick to the same experiences, despite being surrounded by thousands of options on any given night. “To get the most benefit from Sosh, the app works off of the interests and types of activities you’ve chosen. Recommended events will be filtered based on day of the week and time of day.” With a goal of expanding to more cities and making the service “smarter, more proactive and more predictive,” Katrina sees limitless potential for city residents across the country. Katrina commends Sosh for allowing people to “experience real world life in a way that previously seemed impossible.” Users can expand their city boundaries and take advantage of much more that Chicago has to offer. Click here to join Sosh Chicago today. I can’t wait to try this! Downloading it now.